If you trust your customer to pay you back, will you receive their loyalty plus interest? Well, that’s what I did. No, I didn’t take out a loan or buy a car. I was just getting some chicken. Popeyes fried chicken to be exact. No, this isn’t paid advertising, just customer loyalty. See, I was recently at the Popeyes drive-thru buying a quick meal for my hungry children and sick wife. Upon placing my order and driving up to the window, I discovered that, lo and behold, my wallet had gone missing. As though the day couldn’t have been worse. I felt as though every person and object I came into contact with had colluded to ruin my day. Then a miracle happened. A miracle in the form of one manager named Gilbert. What happened was so shocking and so restorative that I absolutely had to make a video about it. This week’s theme is trust…not just trust in your employees or trust in your systems, but trust in your customers. Look, I get it. Trusting strangers with your stuff is hard. After all, the incentive for the customer is to take more. More potatoes, more macaroni. More! Yet, if you’re willing to take the risk and put more control in your customers’ hands, they will pay you back with loyalty, community, and maybe, in my case, social media marketing money can’t buy. Are you willing to trust your customers or are you too chicken? BONUS VIDEO: An interview with Gilbert! Find out why he was willing to trust me, and why he’ll keep doing it. Want to build a loyal following? Dave’s newest book, The Result, can help you build a strategy for serving and retaining your customers. 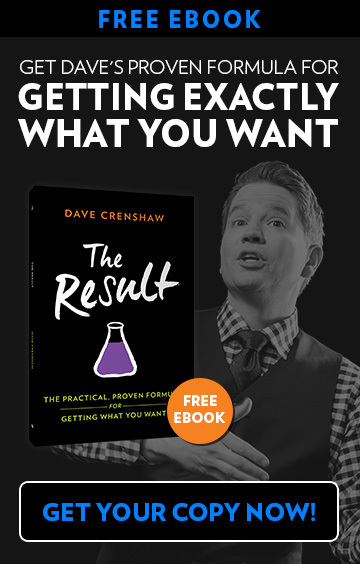 For a practical, proven formula for getting what you want, download The Result for free, by clicking here..